Seattle, WA —The University of Washington Athletic Department’s sustainability program has chosen GreenDrop Recycling Stations to help implement their strategic sustainability plans for waste diversion at Alaska Airlines Arena and the newly renovated Husky Stadium. The Athletic Department’s sustainability committee, better known as the “Green Team,” selected GreenDrop Recycling Stations from Pacific Cascade Corporation as an instrumental part of the recycling and composting program at both venues, where over 730,000 guests attend annually. 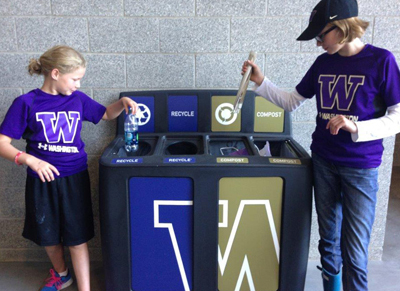 Two Husky fans support the University of Washington Athletic Department’s sustainability efforts by self-sorting recyclable and compostable items into one of the 169 GreenDrop Stations deployed at Husky Stadium and Alaska Airlines Arena. GreenDrop Recycling Stations reduce landfill contributions by users easily self-sorting recyclable and compostable items so are not placed in the landfill waste stream. Self-sorting reduces the Athletic Department’s environmental footprint while minimizing expenses and being fiscally responsible through sustainable operations. The unique, market-leading GreenDrop Recycling Station was designed through multi-year efforts of the Portland Trail Blazers head office and the newly named Moda Center, formally the Rose Garden Arena. The arena’s landfill diversion rate increased from 38% in 2007 to 90% in 2011, in part by replacing old-style garbage cans with GreenDrop Recycling Stations. GreenDrop stations reduce landfill contributions by visually guiding users to properly dispose recyclable items. GreenDrops are a key tool in reducing a venue’s environmental footprint through fiscally responsible sustainable operations. “We’re seeking LEED Gold Certification and greatly increasing our landfill diversion rates is essential to receive that award,” said Dan Gaston, University of Washington Athletics Assistant Athletic Director, and Event and Operations Manager. University of Washington (UW) is a public research university in Seattle, Washington. Founded in 1861, UW is one of the oldest universities on the West Coast and one of the top medical schools in the US. Known as the Huskies, The sports teams participate in the National Collegiate Athletic Association’s Division I-A and in the Pacific-12 Conference. Among its facilities on campus are the newly remodeled Husky Stadium (football, track and field), the Alaska Airlines Arena (basketball, volleyball, and gymnastics) where the GreenDrop Stations will be deployed. The University football team won the 1960 and 1991 national title, to go along with eight Rose Bowl victories and an Orange Bowl title. The men’s basketball team have appeared in 16 NCAA Tournaments and 7 National Invitation Tournaments. Since 1987, Pacific Cascade has been providing the Parking, Hospitality, Traffic Enforcement, and recently adding the Environmental Sustainability Industries with products to manage and support their effective operational needs. GreenDrop Recycling Station received a 2012 Product Competition Award for Recycled Product of the Year.